Yesterday Ms Birbili, Environment Minister, challenged the latest government ruse to raise money: she refused to “legalise” houses built in non-urban zones and without building licences in exchange for quite large fines. Today, after meeting with Finance Minister George Papakonstantinou, Ms. Birbili agreed that the decision had been made by the Council of Ministers and should be respected although she stipulated that she will not agree to“legalization” but an “arrangement” between the owners and the government; an arrangement of course that will come at a price. An arrangement that will keep the owners of these illegally built houses hostages to all future governments as well. They might be called to pay again if the need arises….. According to government sources there will be no arrangement for houses in forest areas, on the shores or within archaeological sites!!Mr. George Petalotis, government spokesman, claimed yesterday that the “arrangement” for houses built haphazardly, outside urban areas and without town planning, would definitely be “within the framework of the Constitution” and will fall within a broader spatial planning which is already being elaborated. The painful reality is that this “arrangement” will bring large amounts of money to the empty state coffers but will undermine further any effort for environmental planning, for a future at peace with nature. Unfortunately Ms. Birbilis has provided this shameful “arrangement” with a cloak of respectability. Mr. Papandreou has managed to keep his government together at the expense of any hope the greek people had for more environmental security and “green development”. The first ever Minister of Environment in Greece, Ms T.Birbili, Prime Minister’s Papandreou personal choice, is also the first Minister to refuse a proposal by the Ministry of Economics. Ms. T. Birbili stated at a recent interview that she will not condone any legislation that will hurt the environment in order to collect taxes. This comes shortly after the doubts expressed by her and another three ministers regarding the privatization of the energy public utility company. In addition, Ms Birbili said this morning that she would meet with the representatives of Keratea to discuss the issue of the landfill and agreed with the inhabitants that there should be more dialogue with them in order to reach a compromise beneficial to all. The Greek government spokesperson rushed to deny any rumours of a government reshuffle or premature elections. Needless to say that this fed the rumours instead of quieting them down. One more complication for Prime Minister Papandreou. This will also pass… : could that be the secret of a long and healthy life? I watched a tv documentary the other day dedicated to the oldest and fittest people in Greece. It was actually filmed on the island of Ikaria, on the Eastern side of the Aegean, very close to the Turkish shores. People of over 90 smiled peacefully, some sang and fewer danced before the camera. The common denominators that emerged are: little food locally produced, close family and communal ties, at least a glass of red wine daily and lack of stress. The journalist focused on the latter and the answer was that the vast majority of old people were happy to live within a very small income lived very close to nature and kept age old traditions that provided them with entertainment without costing a lot, with social contact and a safety net against stress and pressures. The one real example of how these people apply what they preach to real life and impressed me the most was the hand embroidered sign one of the grandmothers had bequeathed to her grandchildren: “This will also pass…” . A message of patience and fortitude, so simple and yet so deep, it teaches us how to resist the disease generating stress and the various unavoidable difficulties of everyday life. A message of hope and survival in today’s crazy world. Athens is not my favourite city. I don’t like cities in general. May on the other hand is a totally different situation. You can feel it in the air that becomes crispy clean, you can hear it in the birds, you can see it in the budding flower pots, you can touch the dew in the morning and collect daisies in the empty plots. If you want to visit Athens I suggest May and the southern side, across the Saronic Gulf. Hotels of all kinds – medium and extremely expensive – restaurants of all types (the fish is exorbitant unless you chose ouzeris – a mezedes oriented ouzo serving bistrot type food shop – and have small fish which are actually the freshest any way! 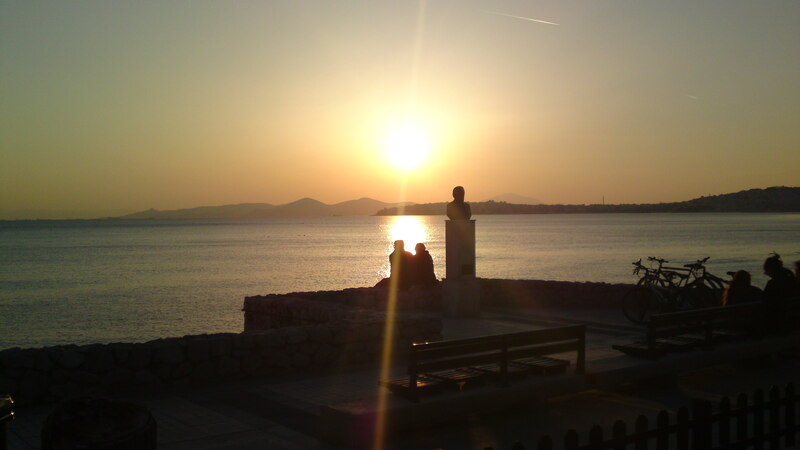 Stay in Palaio Faliro or around that area, use the tram and visit all the main sights without hassle during the day and spend your evening strolling by the seaside, rubbing shoulders with the locals, eating roasted corn cobs or souvlakis. Don’t forget to go to an open air cinema if they are open, an unforgettable experience. Hainides = rebels= music for esoteric rebellion! Hainis means a rebel in the Cretan dialect. I only learned it because of the band “Hainides” whom I fell in love the very first moment I heard their music. Their sound covers the Mediterrannean and discovers the Balkan side of my roots. Their lyrics, original yet in direct connection with the remotest corners of our part of the world are an awakening. If you cannot be anything else in this world at least be true to yourself, be genuine, connect with other people in any way possible. Before I start sounding like a whiskey ad (follow your heart… ) I want to tell you that yesterday we went to a music club in Athens and listened to that band which performed there just for two weekends. It was an experience to remember. Using instruments from all over Greece but keeping center stage for the Cretan lira the Hainides managed to take us with them on unknown roads and unimaginable trips. An all age audience listened attentively, danced discreetly and shed a tear when a song moved them beyond the usual. Keratea is a quiet, sleepy little town lying to the south east of Athens. Surrounded by fields, low hills, olive groves and orchards it has a charming serene quality which has attracted, in addition to its original inhabitants, a large number of Athenians who commute every day just to escape the noise and the pollution of the metropolis. Unfortunately, this idyllic atmosphere was shattered last year by events that were unheard of in the post junta Greek history. This peaceful, fertile, historical area, a region full of ancient relics and rich in minerals of all sorts, was chosen for the creation of a landfill! In reality the problem started long ago but was kept under wraps by all the governments since they knew that their choice was, to say the least, doubtful and a law suit against them would have been won by the inhabitants of the area if it was tried fairly: The area is of great archaeological value and is protected as a region of great natural beauty. In addition, it is situated right on a seismic fault which makes it totally unsuitable for such use. Unfortunately, Keratea was called upon to pay for the sins of all the post junta governments who never had any environmental sensitivities and therefore never properly planned the disposal of waste of the greater Athens area. The arbitrary decision made by the government was directly challenged by the municipality of Lavreotiki which, according to the new Kallicratis law, is now made up of Keratea and Lavrio, the other historical town of the region. The citizens of Keratea, most of them descendants of the Albanian warriors who followed the Turkish troops and settled in various parts of Greece, refused to accept a decision that was made behind closed doors and obviously in desperate hurry – the government was and still is afraid that it would have to pay fines for the old type landfills it has constructed all over Greece and on the other hand they do not want to lose the European Union funding which has a specific deadline. On December 10 2010 riot police accompanied the bulldozers of the constructors and tried to forcefully enter the area allocated. The people of Keratea decided that they could not allow their livelihoods to be thus destroyed and barred the roads leading to the construction site. According to the inhabitant’s testimonies a real battle ensued with the police special forces at a disadvantage since they did not know the lay of the ground and could not move easily due to their heavy shields, helmets, clubs etc. The injured were numerous on both sides. Similar attacks, ambushes, skirmishes have been going on now for 120 days!! The municipality has a siren that announces the arrival of the police forces and the citizens barricade themselves. There are road blocks on both ends of the town of Keratea and the local businessmen are driven to distraction but still resolutely refuse to allow the construction of the landfill which would destroy them for good. The most amazing thing is that while this has been going on for four months very little is known about it by the majority of Greek society. The internet community is informed by two blogs- antihyta and the Lavreotiki blog- but one must keep in mind that while there is a tremendous increase in the use of the internet it is not as common as it is in other parts of the world and therefore this strange “war” is being waged in absolute and very loud silence. The mainstream media report very little about it and reproduce the government arguments with very few exceptions. Please note that many of the larger .mass media owners are also constructors who undertake government contracts – can you see the lovely connection? 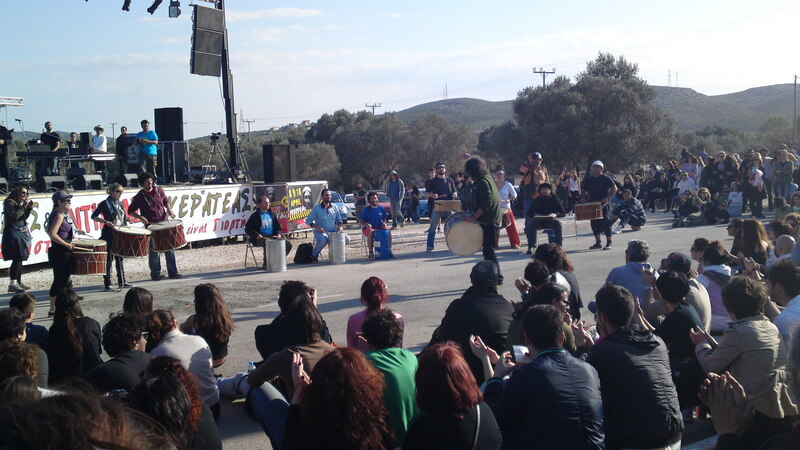 During the 8-10 April weekend the people of Keratea organized the Resistance Festival with the participation of poets, musicians, actors and singers in an area right infront of the construction site so that all those who participated from all over Greece could understand their reasons for refusing the construction. Resistance veteran Manolis Glezos and the world famous composer Mikis Theodorakis both visited the Festival and expressed their support to the citizens of Lavreotiki. They joined their voices to that of the thousands of participants who streamed in on foot, on bicycles with their children, pets or instruments and wrote on placards and posters to express their solidarity with the stubborn and brave people of Keratea. Nikos Houndis, member of the European Parliament and left wing members of the Greek parliament discreetly attended the Festival. As I finished my post I checked the antihyta blog. Apparently a “police parade” is hapenning right now. The government would be well advised – especially since it was the first one to introduce an Environment Ministry – to stop this unconstitutional invasion and discuss more modern and less destructive methods of disposal of waste. The technology is there. All they have to do is show the same bravery as the people of Keratea, assume the political cost and plan a project that will be beneficial to the Greek people instead of the various, well-connected, contractors – constructors. 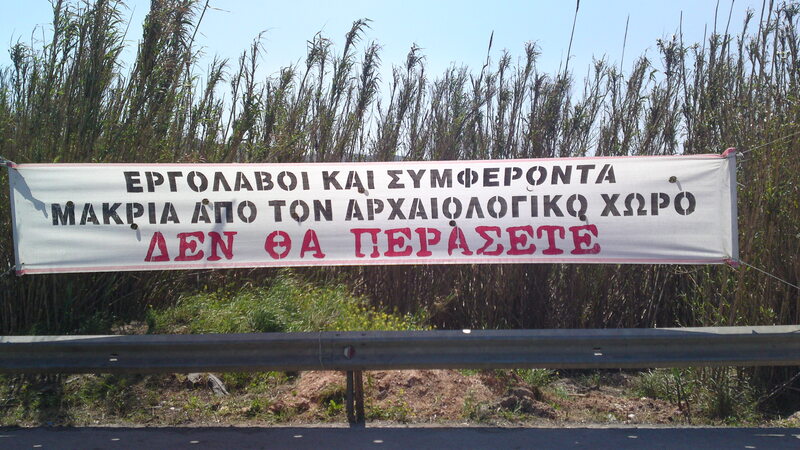 Keratea, south east of Athens, has been “chosen” as the site for the new landfill of Attica. The inhabitants oppose this arbitrary decision and a “silent” war has started between special forces and the citizens of the small town. This weekend the people of Keratea staged a three day Resistance Festival. A playground and puppet show for the kids, a central stage for poetry readings, theatre performances and singing. All around handmade posters and various artifacts inspired by the resistance of the people of Keratea. Mikis Theodorakis, the famous composer, visited the Festival on Saturday while the resistance veteran Manolis Glezos addressed the Festival participants this afternoon. I will give you more information on the story tomorrow. Today watch the video of the area to see why it was proclaimed an area of great natural beauty – proclaimed by a Greek government that is, officially and legally.